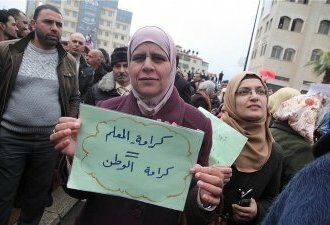 On strike since 10 february, palestinian teachers held again a protest at Ramallah city, West Bank. 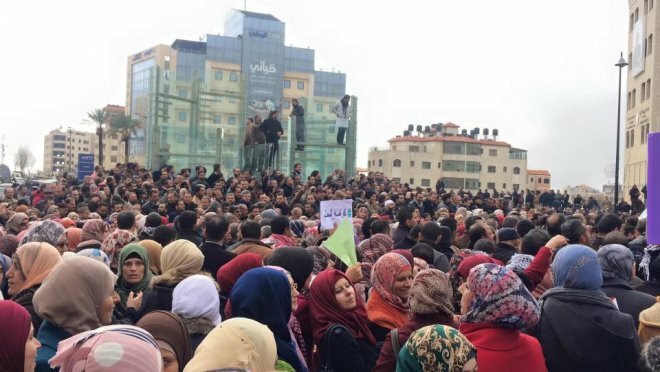 The rally brought pressure against Palestinian Authority to meet teacher’s demands and it got over ten Thousand people. They are fighting for pay increases and for a collective labor agreement signed in 2013. This convention ensures implementation of the career and salary plan, changes in retirement legislation, bonuses based on periods of work experience, and free university education to children’s teachers. The average salary of a Palestinian teacher does not exceed 3,000 shekels (equivalent to 3.040 reais) per month. To get an idea, the average monthly expenditure on rent in Ramallah is around 1,370 shekels, almost half the salary of a teacher. 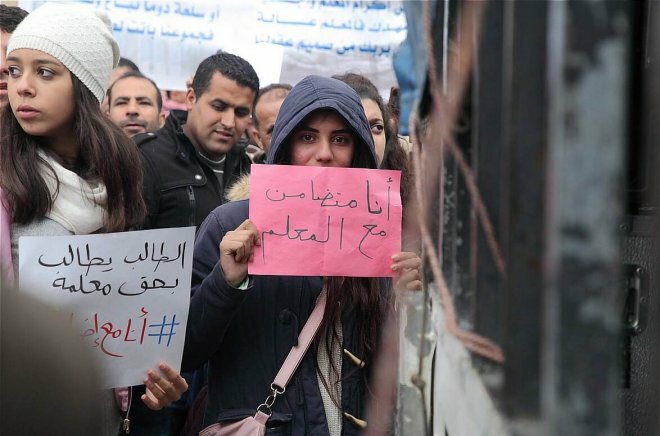 During the demonstration teachers and students carry placards at the demonstration with slogans demanding #Dignity. This has been one of the slogans in the demonstrations and pickets. On Tuesday (16), there was a demonstration attended by more than 20,000 people. After the protest, 22 teachers were arrested in reprisal and intimidation to movement. Teachers were released the next day after protests in cities. The protest this week was not higher just because the government blocked the main Ramallah entrance. In conversation with a teacher, he said it was a nonsense anti-democratic act to block access of the demonstrators and said that regrets the fact that Palestinian Authority uses the same methods of "check-points" used by the Israeli army. Even with repression, more than 10,000 people remained in front of the government headquarters to protest. The event also counted with the presence of students. More acts are being called in the cities and population supports the strike. Imad Temiza, director of the Union of Postal Workers of Palestine said that you can not build a country with dignity without well-paid teachers. This is the general feeling of the population in Palestine. With accession of 95% of more than 35,000 teachers, strike is being organized from grassroots committees in schools and neighborhoods. The strike has an important meaning for being held over the bureaucratic leadership of the union on the government of the Palestinian Authority and the Fatah party. The union is in the same direction since the 60’s. Teachers demand new elections and denounce the union president do not even exercises a teaching career. The current president of the union opposes the strike and, after a meeting with the government, announced his resignation in union with other members who are of the same political party of government, Fatah. Despite the statement, teachers say this may be just another scene play. The strike is being organized by workers and the social networks without the union. A committee called Organization Committee, which was elected by the West Bank teachers was created. One of the proposals of this committee is to build a democratic union and elect new representatives in less than two months. Human rights groups and the General Federation of Independent Trade Unions of Palestine, member of International Labour Network of Solidarity and Struggles, are supporting the strike. CSP-Conlutas were present at the event with members of the Federation. The Central and International Labour Network of Solidarity and Struggles support the teachers’ strike and the struggle of the Palestinian people ! 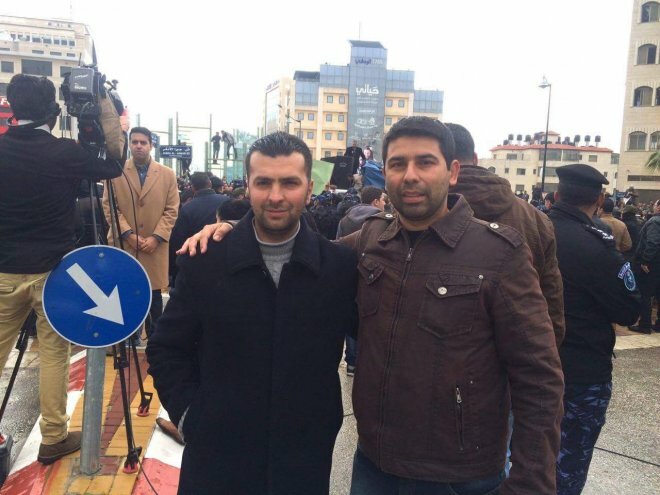 Long live the strike by Palestinian teachers !